Assemble yourselves, please! We've got another amazing matching donation challenge, and you girls need to settle down and get ready to take some pledges! That's right, just like last Friday,, our dear friend, Cynthia, will be matching all of our donations, until they reach $1000. So for every dollar we donate, she'll be donating a dollar too!! Here's a chance to double your dollars and help turn ONE squillion into TWO squillion!! The challenge runs until Noon Pacific Time, so that gives us 4 and a half hours to make it happen. I know we can do it. With our first challenge, we did it in just about an hour! And don't forget all the money we raise this morning, goes right to the Foster Program Fund. 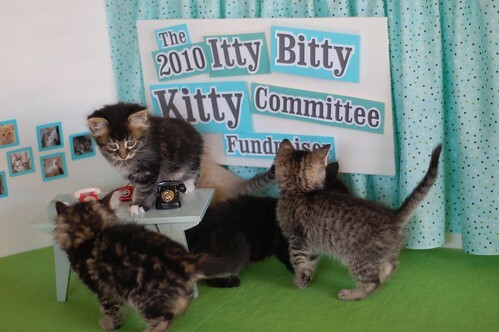 To find out more about how the money helps fostered kittens and big kitties too, please click HERE and read this post from yesterday. What an exciting day this will be! We'll be reaching 20 squillion shortly! We've got two naming rights auctions ending soon, and hopefully we'll find out the names of two more Suprenant Sisters too. Be sure to stay tuned!! they are a 'wee bit' distracted arent they? 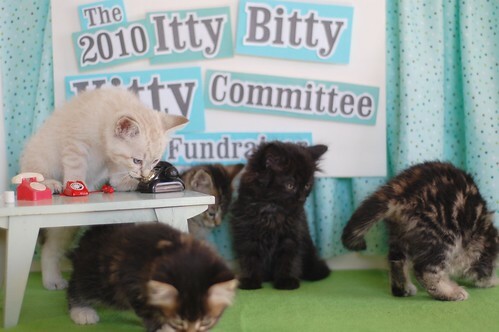 ok first picture, kitten on the left , side view, big dark stripes. who IS that? what a beauty! i am SO far behind! i leave the country for 2 weeks and there's 50+ ibkc posts and already 20 squllion raised! hee hee - Lynx Point looks like she's trying to dial the phone with her nose in the second picture. 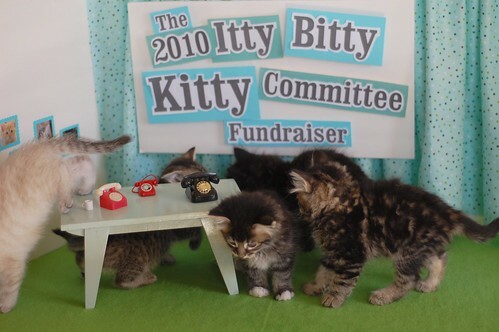 The ittty bitty kitties are so cute with those little phones! !